Hi, my name is Kinley Coulter. 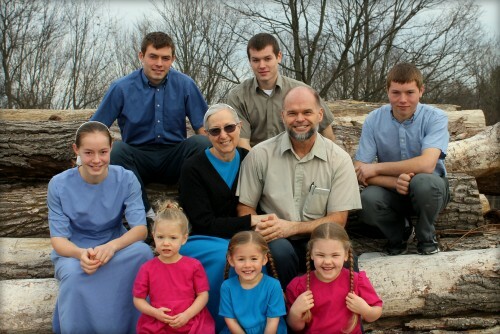 I farm with my wife Rebecca and seven children. 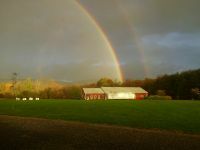 Our Home farm is 220 acres of which 85 acres is perennial pastures. The balance of the farm is woodland. We have our recently acquired dairy herd, and our ewes and lambs pastured and winter housed here. 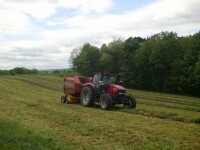 We make hay for winter feeding on an adjoining rented farm. We also own a farm that is 3 miles away, where our married son lives. Combined with some rented pasture, and rented hay ground, that farm is about 86 acres. That farm provides pasture and housing for our brood beef cows and calves . We have been grazing and producing grass fed meat since 2001, and grass fed dairy since 2012. All of our owned and rented land, and all of our cows and sheep are certified organic. In addition to being in charge of everything :), Kinley goes to Farmers Markets in Washington DC 3 days per week to market our products. Rebecca takes care of the family, the website, the email, and the bookkeeping and most of the office work. Jason, our middle son, keeps all the animals alive and fed, does most of the tractor and field work, and milks the cows. In June 2018, his wife, Katrina joined the family, and is adapting to farm life. Next comes Jacob. He has the thankless job of keeping the walkin freezer and cooler organized, and making sure all the cuts of meat and all the bottled products make it onto the trailer for market. He also milks the cows, does fieldwork, and fills in all the gaps in the operation. Jessica helps keep the house running smoothly, fills in on the farm or in the milk processing room, and oversees the little girls. Sabrina, Sarah, and Meagan follow everybody around, help with the garden, and keep the free ranging turkeys out of the flower beds ;).